BackupURL is a URL caching website. In English, this single function site instantly creates a snapshot of a website and provides a link to the cached copy. BackupURL service is very useful for maintaining a preserved historical record of a website. 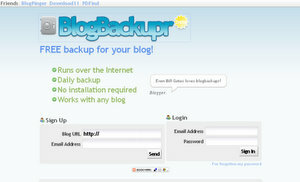 BlogBackupr is a daily backup service for your blog. Backup WordPress, Blogger, and RSS without the need to install anything.